The Venetian army strengthened by local men won a battle against the Holy Roman Emperor in 1508, in and around the mountain community of Cadore where Titian had been born.1 In the 1530's he was commissioned to paint a scene from this famous victory inside the Doge's Palace. 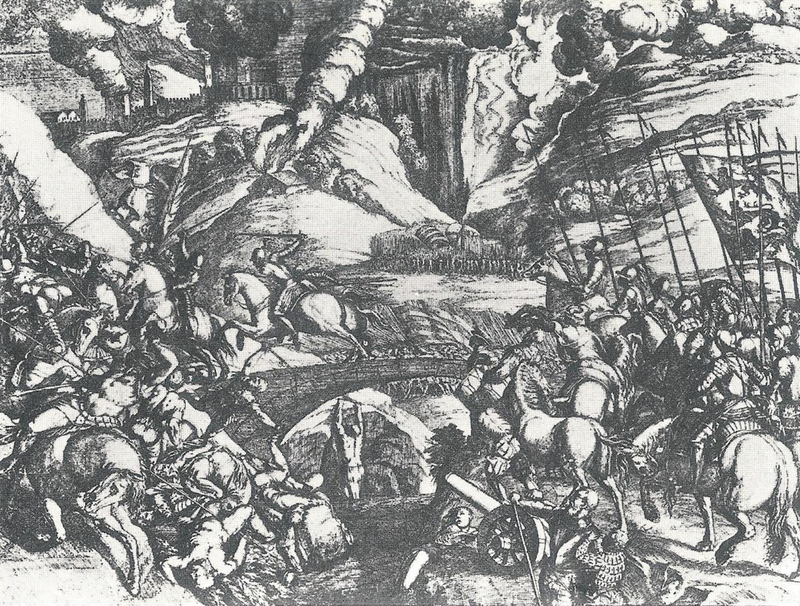 He chose the moment when the Venetian army attacked the enemy pushing them down into a river. 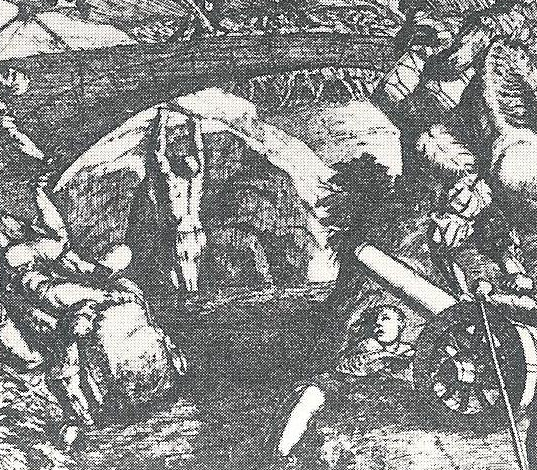 The painting was destroyed by fire in 1577 but we know its composition from an etching (left). 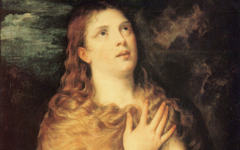 What Titian did is obvious, at least to regular users. Like Michelangelo in The Battle of Cascina and Leonardo in The Battle of Anghiari Titian used this scene of violence to depict the creative struggle in his own mind. 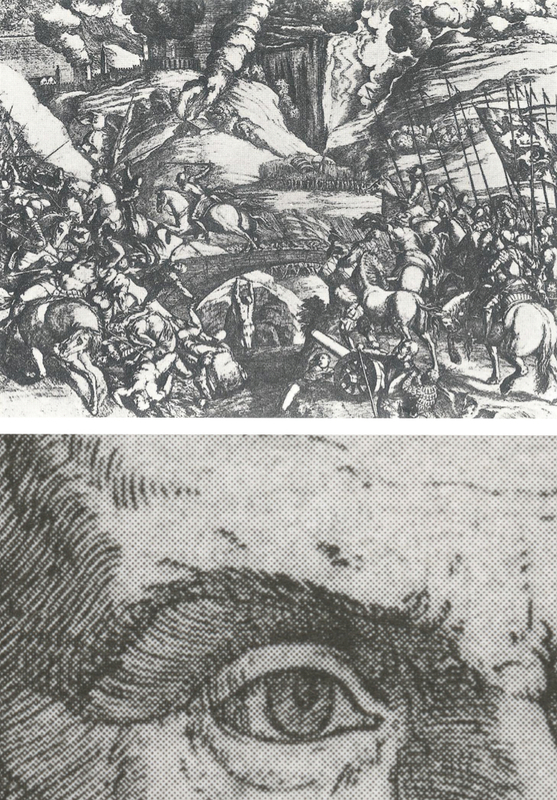 The bridge represents his eye and is compared at left to an enlargement of his eye from an engraving of a later self-portrait. The allegory is made all the more more personal by the battle's location, his own birthplace. Through the bridge, which is both the symbol and shape of Titian's eye, we see a man clinging to a rock rounded like an iris. Another rock by his waist is Titian's "pupil" partly under water as well. The symbolism has never been seen before because convention assumes that artists illustrate what they are told to. Instead they generally use their creativity to turn the commissioned subject into an allegory allegories on their own creativity. 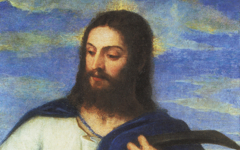 As in similar masterpieces by Leonardo and Michelangelo we are behind Titian's eye and in his mind. 1. 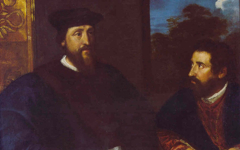 The Holy Roman Emperor was Maximilian I; Titian's wife was also from Cadore. Original Publication Date on EPPH: 11 Feb 2012. © Simon Abrahams. Articles on this site are the copyright of Simon Abrahams. To use copyrighted material in print or other media for purposes beyond 'fair use', you must obtain permission from the copyright owner. Websites may link to this page without permission (please do) but may not reproduce the material on their own site without crediting Simon Abrahams and EPPH.